Joe Pietruch began working with students and faculty to develop a revolutionary new video game that allows up to as many as eight people to play simultaneously on one screen. RIT lecturer Joe Pietruch hopes to bring gamers together with his new video game, &#8232;Chain Gang Chase. The game challenges two players to share a single controller, letting up to eight people play simultaneously. Many popular video games such as Mario Kart or Call of Duty only allow up to four local people to play at once. So, unfortunately, your other houseguests have to patiently wait to play. To solve that problem, Joe Pietruch, a game design and development lecturer at RIT, began working with students and faculty to develop Chain Gang Chase, a revolutionary new video game that allows up to as many as eight people to play simultaneously on one screen. 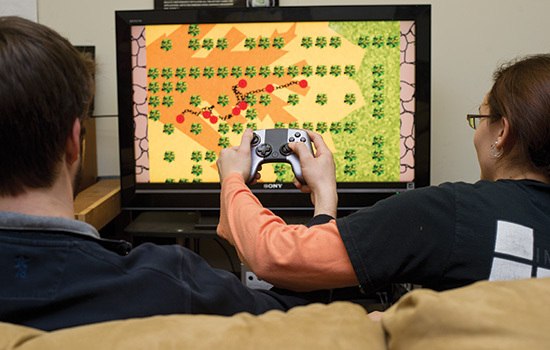 The cooperative play video game for the Ouya and desktop computer challenges players to work together by having two players share a single controller. In the game—which was partly inspired by the movie O Brother, Where Art Thou?—each player is a member of an escaped chain gang searching for a train to cut off their shackles. The adventure ensues as gamers work together to follow maps, solve puzzles and avoid trees, detection and capture. Once they reach their destination, it’s a race to break the chains over the tracks while dodging the train. “I knew that I wanted to create a game in the ‘couch co-op’ genre where people can play as teammates in the same room,” Pietruch said. “It’s always more fun when you can elbow, laugh and yell at your friends while trying to beat a hard level. Pietruch began creating Chain Gang Chase during a 25-day sprint in June, working to build a game prototype and the backend for a map editor website that allows people to draw in trees, fences, and gates to create their own maps. The challenge was getting around corners, through narrow passageways and coordinating how to rush the tracks to cut the chains, while being connected with seven other people. The game surpassed its campaign fundraising goal, earning $11,662 and allowing Pietruch to hire a game developer and Web developer, both co-op students through RIT’s Center for Media, Arts, Games, Interaction and Creativity (MAGIC). The team plans to debut a playable version of the game at the Imagine RIT: Innovation and Creativity Festival on May 3 and unveil a published version in the Ouya marketplace in late May. The game will be free to play with 15 to 20 maps and will offer a one-time payment of $20 to unlock more maps.